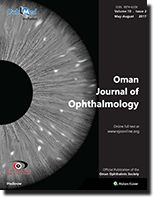 Purpose: To describe the epidemiology of ocular trauma in a tertiary hospital setting in Muscat, Oman. 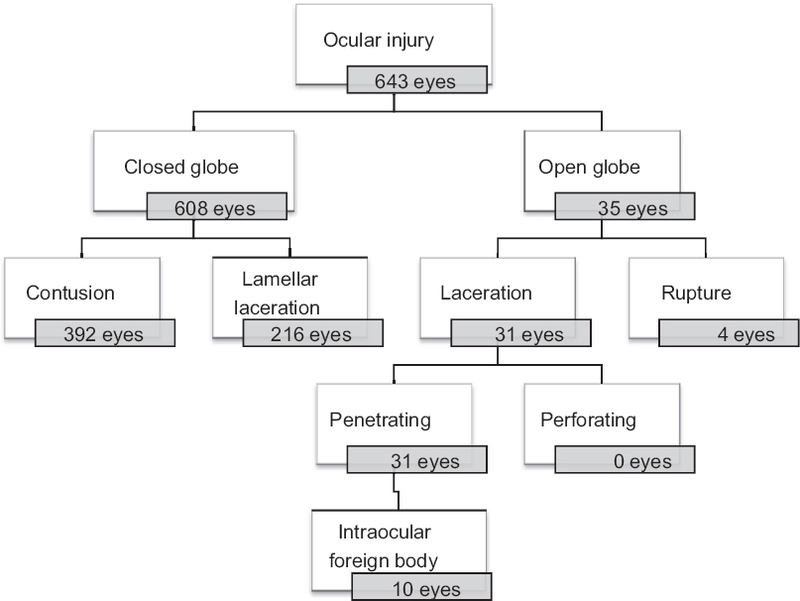 Methods: Medical records of all cases of ocular trauma which presented to the Emergency Department at Al-Nahdha Hospital and were seen by the ophthalmology service from January 1, 2013 to June 30, 2013 (6 months) were reviewed to collect data on ocular trauma according to the World Eye Injury Registry initial reporting form which uses the Birmingham Eye Trauma Terminology System. Results: There were 27,951 patients seen at the Emergency Department and 611 of which were ocular trauma cases (cumulative incidence 2.2% [confidence interval 2.0-2.4]). The mean age of the patients was 23 years and males comprised the majority of the cases (72%). Thirty-two patients had bilateral injury giving a total of 643 eyes injured. More than half of all injuries were caused by either blunt or large sharp objects. 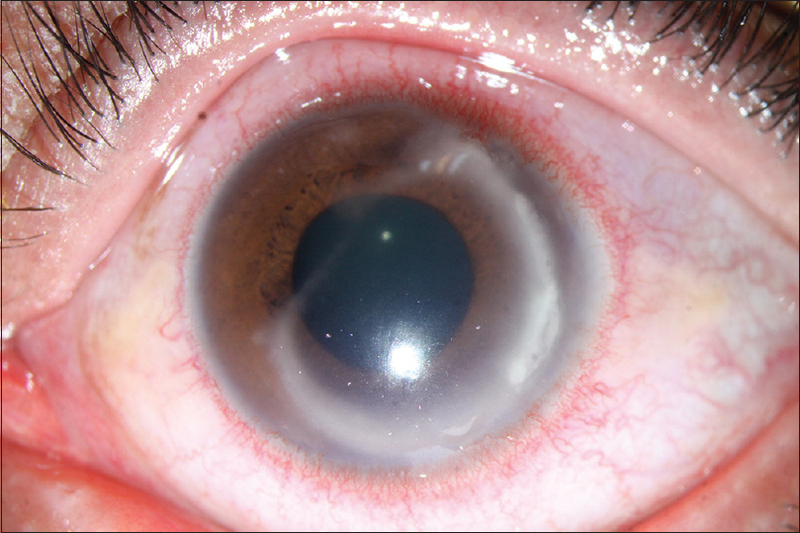 The cornea was the most frequently injured tissue (49%), but most injuries were minor in nature. More than three quarters (77%) of all eyes had a visual acuity of 0.3 (LogMAR) or better on presentation. There were 35 eyes (6%) with open globe injuries (OGI) and three-quarters of them occurring in the manual laborers. Conclusion: Ocular trauma is a common presentation at Al-Nahdha Hospital. Although the majority of trauma cases were minor without any visual disability sequelae, OGI could have been prevented with better ocular protection in the workplace. OBJECTIVE: The objective of this study was to evaluate the outcome of management in eyes with intraocular retinoblastoma (RB) that had received inadequate initial therapy (chemotherapy without focal therapy) before eventually receiving necessary consolidation therapy at a tertiary referral center. METHODS: A retrospective observational case series of 30 eyes from 26 RB patients who had initially received systemic chemotherapy as a sole therapy. The main outcome measures were demographics, laterality, International Classification of RB (ICRB), treatments, tumor control, and survival. RESULTS: The median age at diagnosis was 24 months and the median delay between time at diagnosis and time at referral to a tertiary center that has adequate focal therapy for RB was 9.5 months (range 5–20 months). Sixteen (62%) patients were monocular from enucleation of the contralateral eye. Features of ICRB Group A tumors were seen in 3 (10%) eyes, Group B in 7 (23%) eyes, Group C in 2 (7%) eyes, Group D in 16 (53%) eyes, and Group E in 2 (7%) eyes. Eighteen (69%) patients required more systemic chemotherapy (median, 4.4 cycles; range, 2–8 cycles), and 8 (26%) eyes received local chemotherapy (subtenon, intravitreal, or intra-arterial). All treated eyes received consolidation therapy as transpupillary thermotherapy and/or cryotherapy. Radioactive plaque therapy was used in 1 (3%) eye and external beam radiation therapy in 3 (10%) eyes. 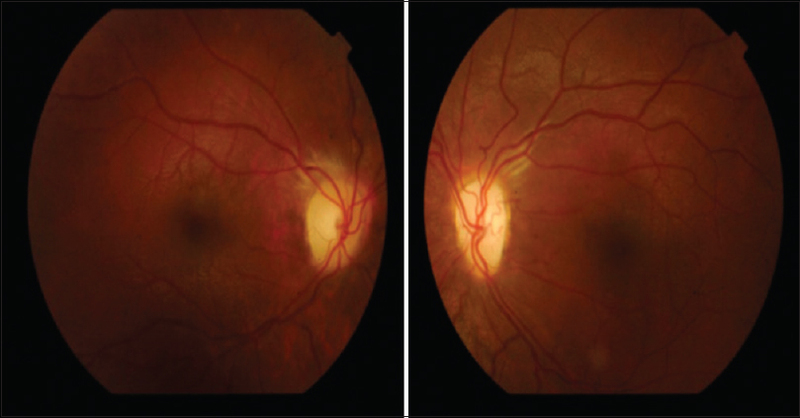 At a mean follow-up of 13 months (median, 11.5 months; range, 9–27 months), enucleation was avoided in 25 (83%) eyes. 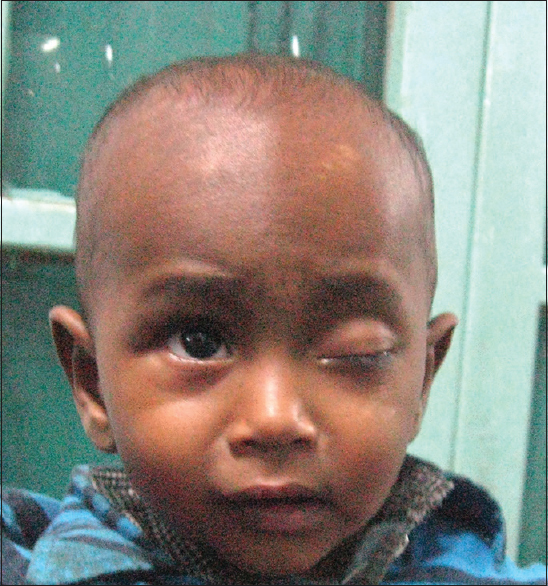 Two (7%) eyes were enucleated initially, and 3 (10%) were enucleated after failure of additional therapy. Twenty-three (77%) eyes did not show any viable tumor after a median of 11.5 months of follow-up after the last treatment, and 2 (7%) eyes still have residual tumor recurrences that need more consolidation focal therapy. CONCLUSION: Chemotherapy alone cannot eradicate RB cells in effected eyes without combination with consolidation therapy by a multidisciplinary team to salvage the affected eye as well as its vision. Nonetheless, chemotherapy can be initiated (to keep the tumor at a less invasive stage) for patients from centers or countries where combination therapy is not available until they gain access to adequate management of RB. 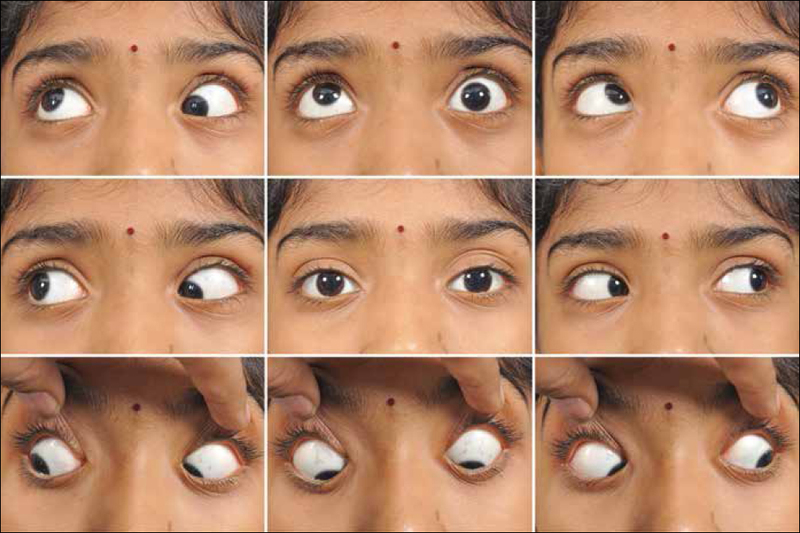 CONTEXT: Surgery for horizontal strabismus reportedly has a success rate of 60%–80%. However, which preoperative factors are predictive of this success is not clear. AIMS: To identify prognostic factors those are predictive of successful outcome in horizontal strabismus surgery. SETTINGS AND DESIGN: Observational analytical study using multiple logistic regression (MLR). SUBJECTS AND METHODS: We assessed the medical records of patients who had undergone first-time horizontal muscle strabismus surgery between 2002 and 2013, where complete follow-up data were available for ≥6 weeks, and also, we collected data prospectively on patients operated between January 2014 and September 2015. Successful outcome was defined as a postoperative angle of deviation within 10 prism diopter of orthophoria at ≥6 weeks postoperatively. Independent variables considered were age at onset, age at surgery, duration, gender, deviation - type and amount, logMAR visual acuity (VA) - mean and of the poorer eye, mean refractive error, amount of anisometropia, and presence of dense amblyopia. Only those with P< 0.2 on univariate analyses (UAs) were included in the MLR, with significance set at P ≤ 0.05. STATISTICAL ANALYSES: UA (Chi-square for categorical variables and t-tests for continuous variables), followed by logistic regression analysis. RESULTS: Of 113 patients, on UA, type of deviation (P = 0.01), age at surgery (P = 0.16), absence of dense amblyopia (P = 0.002), and logMAR VA of the poorer eye (P = 0.005) qualified for the inclusion in MLR. On MLR, esotropia (ET) (odds ratio [OR]: 4.46) and absence of dense amblyopia (OR: 5.90) were associated with success. CONCLUSIONS: With an overall success rate of 83%, ET and absence of dense amblyopia were significantly predictive of surgical success. BACKGROUND: Conjunctival sutures used in pterygium surgery are not only time-consuming process but also may lead to local complications such as discomfort, scarring, granuloma, or infection. Plasma-derived products such as fibrin glue may produce possible hypersensitivity reactions whereas the risk of viral transmission remains theoretically possible. We describe a simple method of achieving conjunctival autograft adherence during pterygium surgery avoiding potential complications associated with the use of fibrin glue or sutures. 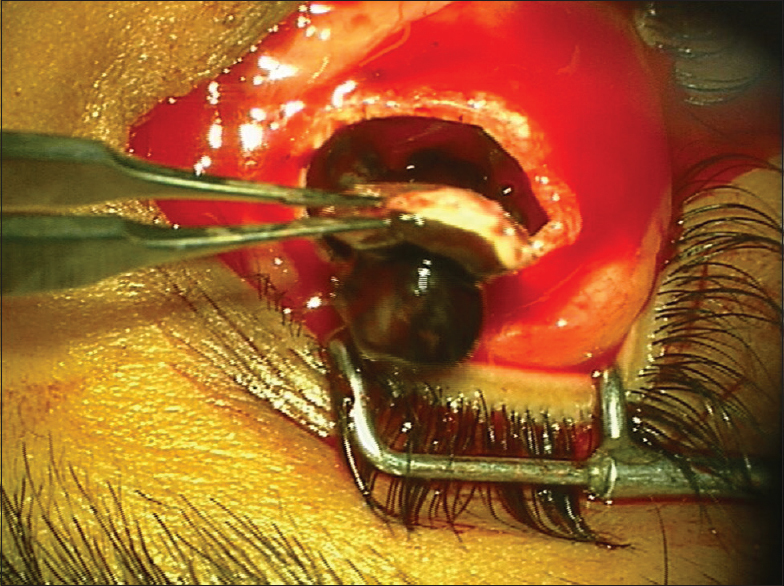 MATERIALS AND METHODS: After pterygium excision and fashioning of the autologous conjunctival graft, the recipient bed is encouraged to achieve natural hemostasis and relative desiccation before graft placement. Excessive hemorrhage in the graft bed is tamponed. 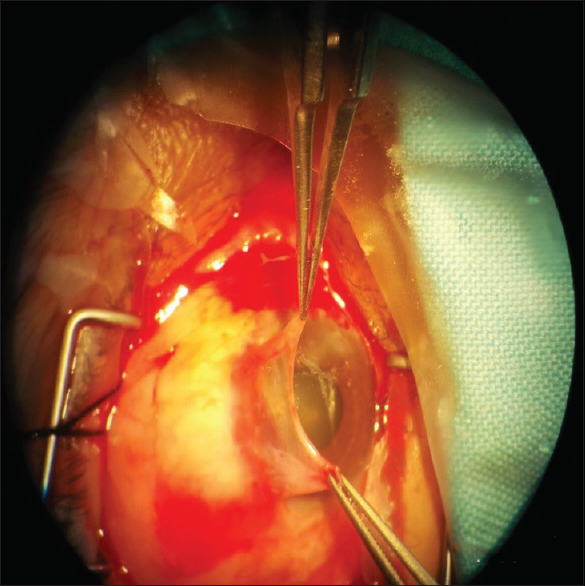 Graft adherence and positioning is examined 12–15 min after surgery. RESULTS: A total of 205 cases of pterygium underwent excision with conjunctival autograft without using sutures or glue. Mean follow-up time was 14.6 months. Cosmesis achieved was excellent in all cases. There were no intraoperative complications seen. Recurrence was seen in 6.8% of cases (14 cases). 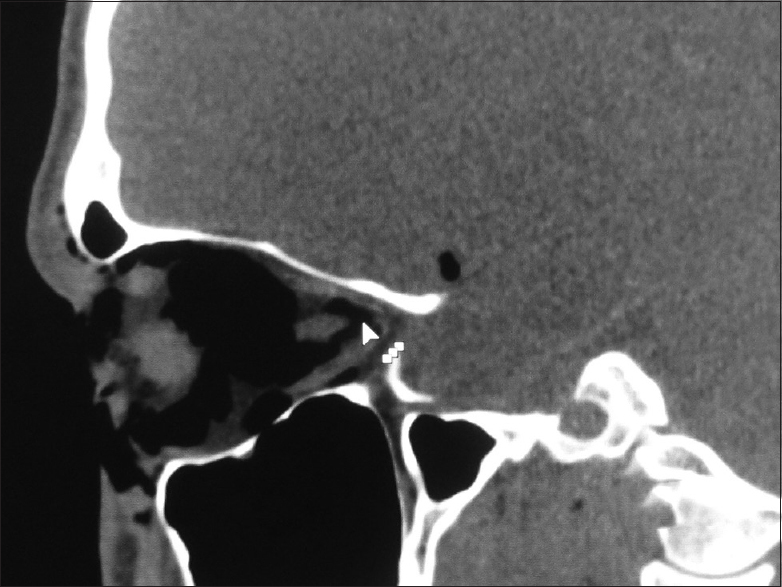 Nasal gaping was seen in 36% of cases (74 cases), which healed spontaneously without any surgical intervention. CONCLUSION: This simple technique for pterygium surgery is not only cost effective and quick but also may prevent potential adverse reactions encountered with the use of foreign materials and in this large series provided safe and comparable results to current methods. PURPOSE: To study the exposure rate of orbital implant postenucleation or evisceration procedures in two tertiary hospitals in Oman. DESIGN: A retrospective, descriptive, cross-section study. MATERIALS AND METHODS: Patients' records were reviewed for patients' demographics, surgical indications, implant types, follow-up and any reported complications after surgeries. Patients with a minimum of 1 year follow-up period were selected. All patients who underwent enucleation or evisceration with primary orbital implant were included in the study. Patients who underwent secondary orbital implant were excluded from the study. RESULTS: A total of 37 patients (age between 4 and 88-year-old, median age is 54-year-old) underwent enucleation or evisceration during 2008–2014. The most common indications for the surgical intervention were painful blind eye (35%), followed by trauma (16%), and perforated corneal ulcer (16%). Out of 37 patients, hydroxyapatite implant was implanted in 17 patients (46%), a glass or acrylic implant was implanted in 17 patients (46%), bioceramic implant was implanted in two patients (5%), and Molteno prosthesis was implanted in one patient (3%). There was no case of orbital implant exposure in any patients in this study. CONCLUSIONS: No orbital implant exposure was recorded in this study. The surgical technique, end to end rectus muscles suturing, used for enucleation/evisceration was the main reason for reduced implant exposure. In addition, the preexisting ocular pathology did not affect the outcome of the study. PURPOSE: The purpose of this study is to determine the effect of phacoemulsification cataract extraction on measurement of retinal nerve fiber layer and optic nerve head parameters using spectral domain optical coherence tomography. MATERIAL AND METHODS: A prospective, hospital-based study of 100 patients of 40 years of age and above, with no other ocular morbidity except cataract and planned for phacoemulsification with IOL implantation (SN60WF) at a tertiary centre at AIIMS, New Delhi, India. All patients underwent imaging with Cirrus SD-OCT model 400 and the optic disc cube 200x200 protocol at baseline and at 1 month follow up. Paired sample t-test was used to compare the RNFL parameters and ONH parameters. RESULTS: The mean age of subjects was 56.6 ± 12.3 years (70 males, 30 females). The average RNFL increased from 92.6 ± 5.4 μm to 101.3 ± 5.6 μm after phacoemulsification, an increase of 9% (P = 0.003) and the signal strength increased from 5.6 ± 0.5 to 7.6 ± 0.7, increasing by 35.7% (P = 0.004). There was a significant increase in the disc area (P = 0.004) and rim area (P = 0.004) but no significant change in vertical cup-disc ratio (P = 0.45) or average cup-disc ratio (P = 0.075). The quadrant-wise RNFL thickness increase in inferior, superior, nasal, and temporal quadrants was 12.6% (P = 0.001), 10% (P = 0.001), 5.6% (P = 0.001), and 3.2% (P = 0.001), respectively. The change in RNFL thickness was maximum in posterior subcapsular cataract (P = 0.001) followed by cortical (P = 0.001) and nuclear (P = 0.001) subtypes. CONCLUSIONS: A significant increase in RNFL thickness and signal strength was observed after cataract surgery using SD-OCT. The maximum change in RNFL thickness was in the inferior quadrant, where RNFL thinning is a significant predictor of glaucoma progression. The posterior subcapsular cataract interfered with RNFL measurement maximally due to its density and proximity to nodal point. 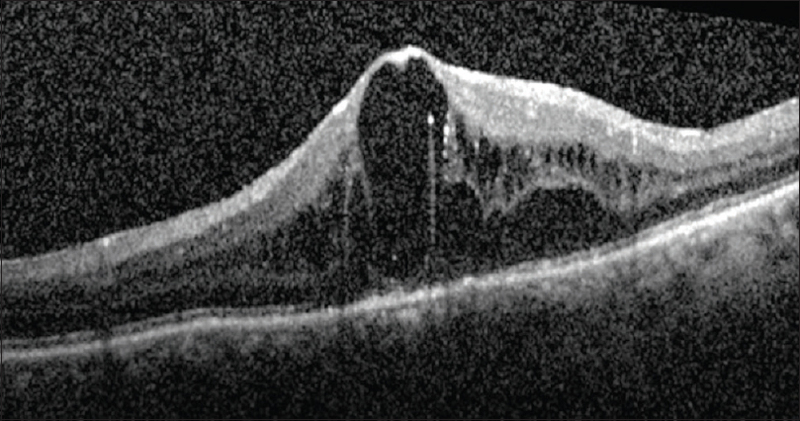 After the cataract surgery, a new baseline needs to be established by obtaining fresh OCT images for assessing the longitudinal follow-up of a glaucoma patient. PURPOSE: The aim of this study is to compare two different methods of analysis of preoperative reference marking for toric intraocular lens (IOL) after marking with an electronic marker. SETTING/VENUE: Cataract and IOL Implantation Service, Shroff Eye Centre, New Delhi, India. PATIENTS AND METHODS: Fifty-two eyes of thirty patients planned for toric IOL implantation were included in the study. All patients had preoperative marking performed with an electronic preoperative two-step toric IOL reference marker (ASICO AE-2929). Reference marks were placed at 3-and 9-o'clock positions. Marks were analyzed with two systems. First, slit-lamp photographs taken and analyzed using Adobe Photoshop (version 7.0). Second, Tracey iTrace Visual Function Analyzer (version 5.1.1) was used for capturing corneal topograph examination and position of marks noted. Amount of alignment error was calculated. RESULTS: Mean absolute rotation error was 2.38 ± 1.78° by Photoshop and 2.87 ± 2.03° by iTrace which was not statistically significant (P = 0.215). Nearly 72.7% of eyes by Photoshop and 61.4% by iTrace had rotation error ≤3° (P = 0.359); and 90.9% of eyes by Photoshop and 81.8% by iTrace had rotation error ≤5° (P = 0.344). No significant difference in absolute amount of rotation between eyes when analyzed by either method. CONCLUSIONS: Difference in reference mark positions when analyzed by two systems suggests the presence of varying cyclotorsion at different points of time. Both analysis methods showed an approximately 3° of alignment error, which could contribute to 10% loss of astigmatic correction of toric IOL. This can be further compounded by intra-operative marking errors and final placement of IOL in the bag. PURPOSE: The purpose of this study was to report a rare case of subretinal lodgement of Ozurdex® implant (Allergan Inc., Irvine, CA, USA) and its effect on macular edema in a case of central retinal vein occlusion (RVO). METHODS: A rare complication of subretinal lodgement of Ozurdex® implant without retinal perforation was encountered in a case of RVO with intractable macular edema. As associated retinal perforation was not noted, no intervention was done. The patient was regularly followed up at 1 month, and the effect on macular edema and intraocular pressure was analyzed. RESULTS: The corticosteroid pellets got disintegrated and totally absorbed with a subtle chorioretinal scar by the 3rd follow-up month without any intervention. Even though subretinal, it was capable of reducing macular edema by 181 microns at 1 month postinjection, and its effect started wearing off by 2 months. DISCUSSION: Subretinal lodgement of Ozurdex® implant is rare and preventable, yet a potential complication of intravitreal implants which is now in vogue. We speculate a too acute angle of injection or incomplete insertion of the drug delivery system applicator (DDS) away from the limbus or perhaps less refined previous DDS applicator to be a cause for subretinal delivery of the implant. The early disintegration of implant occurred due to breach in structural integrity that caused loss of controlled drug release and rapid absorption. It reduced macular edema up to 2 months without elevating intraocular pressure. CONCLUSION: A more widespread application of any technology always portends a more significant risk for complications, and an ophthalmologist should be aware of this potential risk. Though subretinal, corticosteroid implant was capable of reducing macular edema by 181 microns by 1 month and its effect wore off by 2 months. Orbital emphysema and associated pneumocephalus usually result from trauma to orbital bones or due to sinus disease, allowing air to travel from paranasal sinus into orbit and brain. However, it is extremely rare to have orbital emphysema and pneumocephalus in the absence of orbital wall fracture. In our case, a young male was admitted with severe eye pain, diminution of vision due to sudden exposure of compressed air gun. Examination revealed proptosed, emphysematous right eye with conjunctival laceration. Computed tomography scan of the head and orbit revealed multiple radiolucencies with air in the right orbit and brain extending up to the spinal canal without any evidence of orbital sinus or cranial bone fracture. Visual acuity recovered completely on follow–up; however, 2 weeks following injury, the patient developed disabling flashes of light which the patient perceived as central in location and resolved finally over a period of 3 months. Flashes of light, in our case, could be attributable to unnoticed damage to cerebral vasculature or connective tissue surrounding the optic nerve due to pneumocephalus. To report a case of atypical sterile ring infiltrates during wearing soft silicone hydrogel contact lens due to poor lens care. A 29-year-old woman presented with complaints of pain, redness, and morning discharge. She was wearing soft silicone hydrogel contact lens previously; her current symptoms began 1 week before presentation. On examination, best-corrected visual acuity was 20/40 in that eye. Slit-lamp examination revealed dense, ring-shaped infiltrate involving both the superficial and deep stromal layers with lucid interval to the limbus, edema of the epithelium, epithelial defect, and vascularization of the superior limbus. Cornea-specific in vivo laser confocal microscopy (Heidelberg Retina Tomograph 2 Rostock Cornea Module, HRT 2-RCM, Heidelberg Engineering GmbH, Dossenheim, Germany) revealed Langerhans cells and no sign of Acanthamoeba or fungal features, using lid scraping and anti-inflammatory drops; her vision completely recovered. 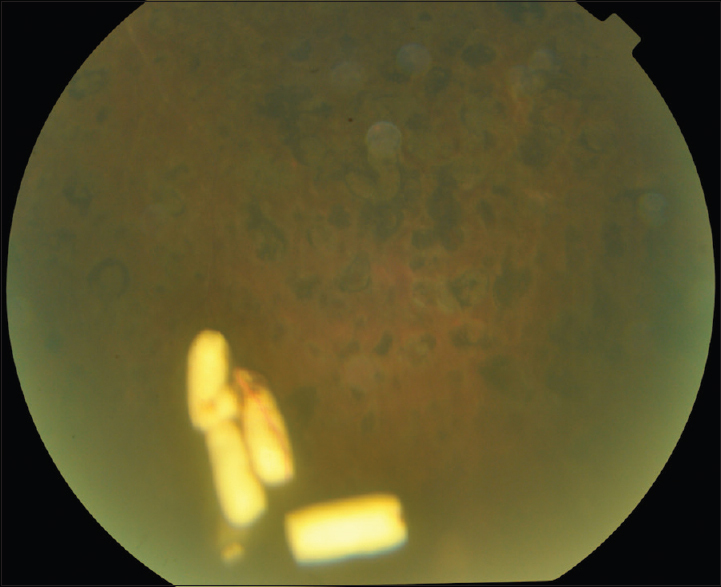 We reported an atypical case of a sterile corneal ring infiltrate associated with soft contact lens wearing; smear, culture, and confocal microscopy confirmed a sterile inflammatory reaction. Dexamethasone intravitreal implantation has been used in various retinal and uveal pathologies. Common complications include cataract formation and raised intraocular pressure. Although uncommon, migration of the implant has also been well reported. We describe a case with migration of the implant into the anterior chamber in a patient with a scleral-fixated intraocular lens, which was managed noninvasively by pupillary dilatation and positioning of the patient. A 4-year-old girl presented with decreased vision since 3 months. Visual acuity was 20/20 in right eye and counting fingers at 2 meters in the left. Left eye examination revealed exotropia, retinal telangiectasia, extensive subretinal exudation over the macula and exudative retinal detachment suggestive of Coats' disease. 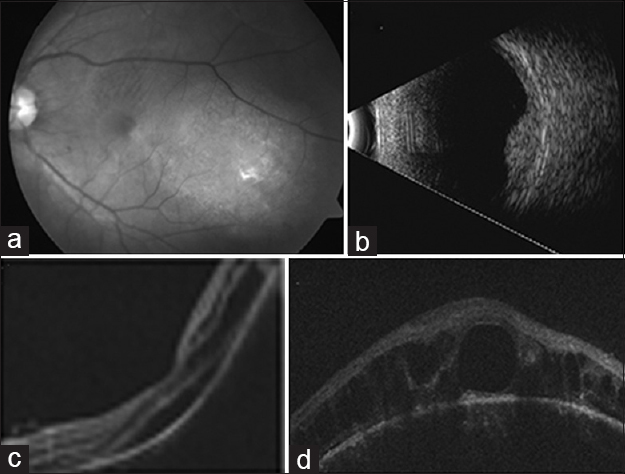 Fundus fluoroscein angiography highlighted the hallmark 'light bulb' retinal telangiectasias, macular retinochoroidal anstamosis and peripheral nonperfused retina. The patient was treated with focal laser photocoagulation to the retinal telangiectatic vessels and scatter laser photocoagulation of the non-perfused retina. Ultrasound biomicroscopy (UBM) remains a potent tool in the diagnosis and characterization of uveal lesions. In the setting of malignancy, it can confirm both placement of and response to brachytherapy. 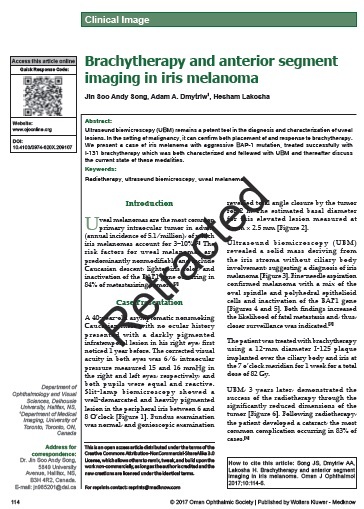 We present a case of iris melanoma with aggressive BAP-1 mutation, treated successfully with I-131 brachytherapy which was both characterized and followed with UBM and thereafter discuss the current state of these modalities. BACKGROUND: Palsy of the oculomotor nerve is rarely seen in children, and comprehensive guidelines for management and outcome are difficult to find. 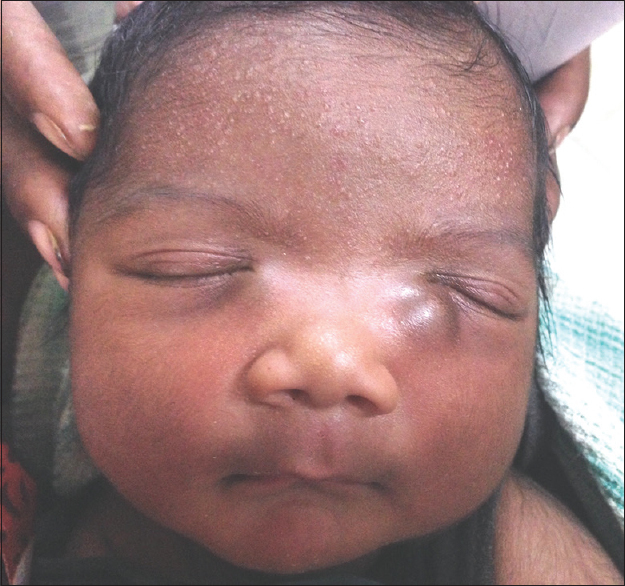 CASE: Here we describe a 8 month old boy with left sided ptosis and infero-leteral deviation of left eye and normally reacting pupil and CSF antimeasles antibody titre negative. OUTCOME: The ptosis improved within 3 weeks with no residual neurodeficit. MESSAGE: Viral mononeuritis leading to partial 3rd nerve palsy is a rare entity in children till date. Crouzon syndrome (CS) is an genetic disorder with autosomal dominant inheritance caused by mutation of the gene for fibroblast growth factor receptor 2 (FGFR2) was described as one of the varieties of craniosynostosis. In this presented case, premature closure of the sutures had caused restricted skull growth and lack of space for the growing brain resulted to shallowed eyes and cranial and ophthalmic deformities and impairment in tooth development. Management of a patient of CS has two components. First is the release of prematurely fused sutures based on evidence of raised intracranial pressure. Surgery is mainly carried out early after 3–6 months. Second is the craniofacial reconstructive surgery including advancement of the maxilla and frontonasal complex; and other surgeries depending upon the deformities. An increased intracranial pressure impairs brain development and can lead to mental retardation. Because of the delayed diagnosis and treatment in this case, visual and hearing loses and decreased mental capacity and mild retardation.